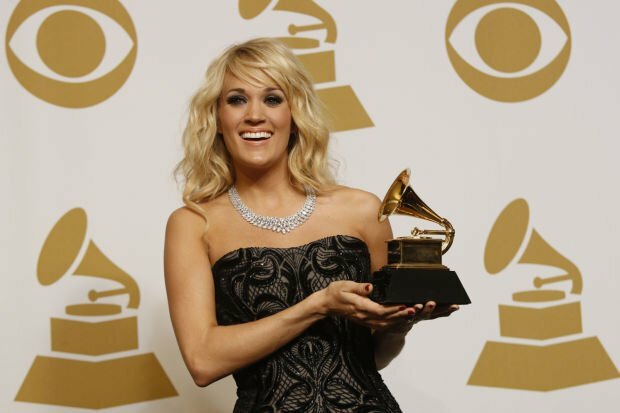 Expect Wild Country to spin plenty of Carrie Underwood, shown backstage at Sunday's 55th Annual Grammy Awards at Staples Center in Los Angeles. Stay tuned at noon to hear songs by super country couple Faith Hill and Tim McGraw. Clear Channel is unrolling its new country music station at noon today, replacing the all-talk KNST 97.1 FM. Wild Country 97.1 FM kicks off with 10,000 contemporary country songs in a row sans commercials. Expect to hear everyone from Kenny Chesney and Jason Aldean to Tim McGraw and Carrie Underwood. In March, the station will welcome the nationally syndicated Bobby Bones Show weekday mornings with Bones and radio personalities Lunchbox and Amy. This is Clear Channel’s second foray into the country music market in recent years. In 2001, it moved its KWFM Cool Oldies from 92.9 FM up the dial to 97.1 FM to make way for KOYT 92.9 FM Coyote Country. Two years later, the company pulled the plug and launched a Spanish-language music station. Clear Channel will compete for listeners with Citadel Broadcasting's powerhouse country station KIIM 99.5 FM, the city's longtime country radio leader.